The release of the PlayStation 4 marked an opportunity to revive the simple yet charming action platformers of old. A time when scripted cutscenes and Hollywood voice acting were unheard of and in many cases were the better for it. So it’s understandable a lot of us stood to attention when Sony unveiled the colourful Knack and, perhaps mistakenly, referenced it to Crash Bandicoot. After delaying some of the PS4’s key launch games into 2014, things were looking very bare. 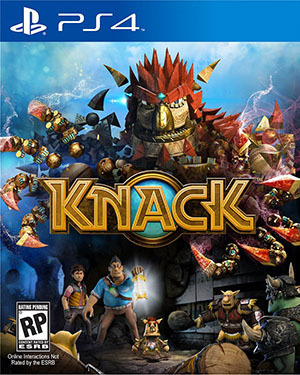 If there was one launch title developed by a first party studio that could act as a system seller Knack had to be the one. Not a sequel to a used franchise or a third party port that was pushed out the door in time for the console’s release. So, what happened? 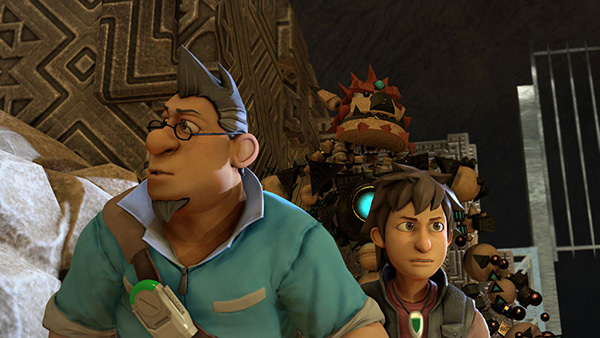 What separates Knack from others in its genre is the focus on the story, which isn’t that bad at all aside from pacing issues and a bizarre lack of focus on one of the main characters. It begins with Dr. Vargas creating a sentient creature using ancient relics, relics that are used as a main source of power for our civilisation. 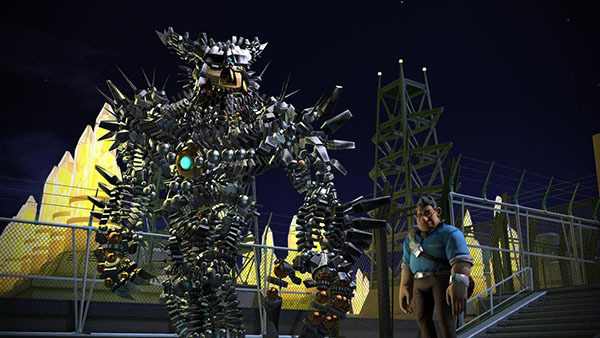 With conventional weapons and the robots manufactured by billionaire Viktor becoming less effective, creating Knack was necessary to counter the goblin attacks. You set off on an adventure, through forests, mines and a city or two with the story pushed along by cutscenes. You’ll uncover a (highly predictable) betrayal, ancient ruins, a long-lost love and even some racial themes with the goblins. Who just want acceptance through violence, after all. The problem is, most of the important scenes are spread too far apart leaving plot development jarring in one small moment before you’re forced to trudge along for another hour without any events. Some characters get ignored completely and you wonder why in the world they’re still there. Such as Lucas, one of the first characters you’re introduced to. 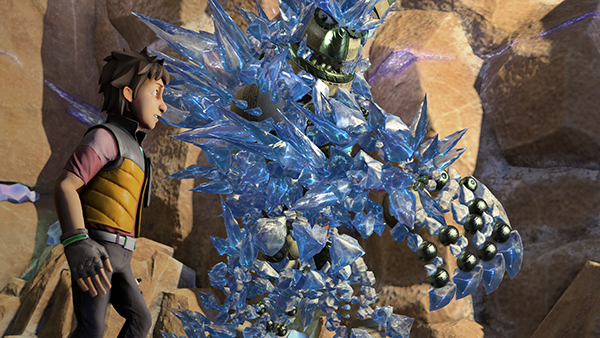 He’s under the care of Dr. Vargas and is presented as Knack’s perfect companion. Young and relatable, you’d think that the kid would play a central role in such a story driven game. Nope. As Knack, you mostly push through each repetitive dungeon either on your own or with the doctor waddling after you. Presented like a Pixar movie (and looking almost as pretty), Knack’s story would be best in a movie format unfortunately. The gameplay and the story hardly complement each other in this case, as unnecessary cutscenes break the immersion and play the game for you while necessary cutscenes are few and far between. Knack ends up being longer in length than it should be, largely due to the gameplay, and you’ll be wishing it ended far sooner than the final 13th chapter. So this is the crux of the game, as it should be. First thing you’ll notice is that most of the Dual Shock 4 controller isn’t used. You have square to punch, X to jump, circle to activate a special attack…and that’s about it. Oh triangle is used, albeit once. I’ll get to that later. Let’s start with the good things. Dodging an attack before smashing the enemy feels satisfying as does unleashing either of the 3 special moves; a devastating shock wave, tornado or long ranged attack. Bugs and glitches are pretty much non-existent. There are plenty of collectables to find in order to use items such as relic detectors and buffs for Knack, most of which won’t be used until your second playthrough. I can’t help but feel there should have been a better way to find these parts, however. 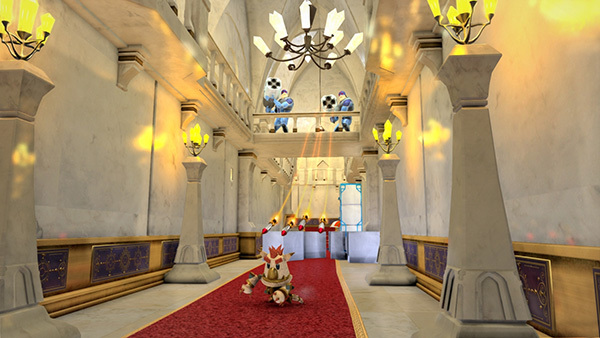 You smash through walls, some obvious, and proceed down a short staircase to a chest. This never changes. Every part is in an identical room throughout the levels, breaking the immersion. As for the combat, it’s borderline mind numbing once you reach the later chapters. 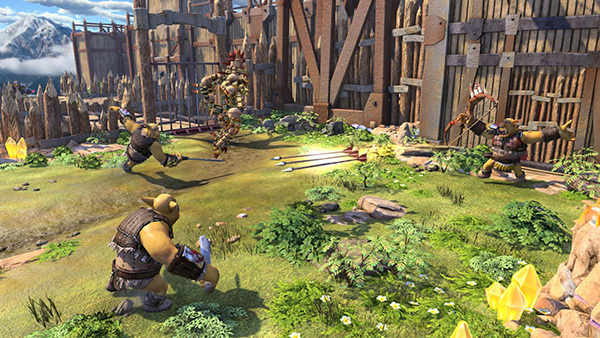 Knack is primarily a brawler and hardly a platformer. Every level contains the same pattern. Melee enemies are backed up by ranged units forcing you to use the same strategy in every encounter. You proceed through each “arena”, killing the enemies before coming across more until the next cutscene. This wouldn’t be such a huge problem if Knack had more attacks, combos and was generally entertaining to play as. But no, you simply dodge arrows and fists before mashing the square button and occasionally hitting circle when things get tough. Yes, this game is hard especially on Hard mode to the point of frustration. It’s not a satisfying difficulty like Dark Souls, though. You soon learn that every checkpoint is actually after a small cutscene, such as Knack jumping down to a part of the level which you can’t do yourself. Most of the enemies shatter Knack in one or two hits, forcing you to slog through the repetitive corridors all over again. The whole pattern of the game, corridors and cutscenes, painfully reminded me of Final Fantasy XIII. To compound this, we’re forced to become big Knack when the game tells us to or become small again after a cutscene. 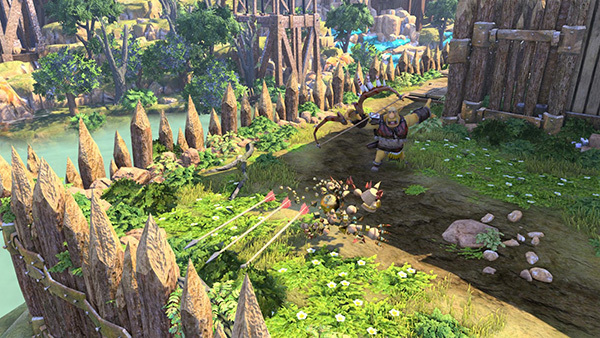 Players have no control over Knack’s form. The game teases you, occasionally, with a hint of what’s possible. A certain boss fight was fantastic which has you battling a giant, teleporting robot. The stealth section was genuinely interesting. You are allowed to use triangle once during the game in order to turn Knack transparent to pass through security lasers. But there are still enemies around and Knack is vulnerable in this form. What follows is you juggling stealth form and normal form, dodging lasers and smashing enemies. It’s moments like these that make you lament the rest of the game, which is an exercise in tedium. Knack looks great, drawing similarities to and featuring the art style of the colourful Pixar films. While the environments are small and very closed, it’s a nice demonstration of what the PS4 can do in it’s opening weeks. 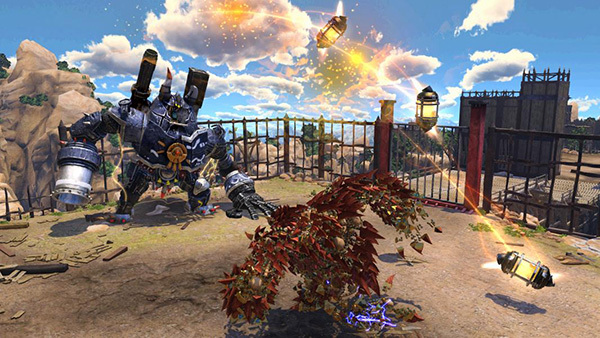 Knack in his largest form is made up of thousands of objects that scatter when you’re hit and impressively come together after a special attack. It’s worth mentioning that I did experience slowdowns and framerate drops when things got very busy. Whether this is a limitation of the hardware or rushed development is unclear. The sound in Knack is a bit of a hit and miss. The sound effects are good, and you’ll never get tired of hearing the relics clack together or the sound of crystals breaking. These sounds also come out of the controller’s speaker, which is a neat touch. Unfortunately the music isn’t that memorable and is too ambient, meaning you won’t be humming any tunes when you’re done. Which is a shame seeing as you’d expect fun music to go with the visuals. The voice acting is mostly well done, but I can’t see the reason why they gave Knack a voice. The charm is almost gone from Knack when he says a line from a weak script in a deep yet flat tone. It’s hard to pinpoint Knack. The monotony and uninspiring gameplay take away the charm from this little brawler. Again, I say brawler because there are virtually no platforming elements. Gamers looking for a challenge will find it on Hard mode, but it won’t be what they expect. Kids won’t stick around for long, as traditionally it’s hooks like entertaining mascot characters and catchy music that we grew up with. Not cutscenes that jump us over a cliff or down a ledge when the game design doesn’t allow us to. It pains me to say this but we can and should do better than this for next gen. After so many years of successful franchises, Knack is a disappointment on every level bar visuals. It’s like the developers forgot what the past 20 years have taught us and are on trainee wheels again. If you want your kids to play something along Knack’s lines, give them any LEGO game or go back to the PS3 and load up the Ratchet & Clank titles. I really do hope the team go back to the drawing board, redesign the fundamentals and give us a Knack 2. Prove us wrong and show us the glimpses seen in this game realised to its full potential. In the mean time, there is little substance to be found here. Sure the game works fine and is solid (unlike other AAA releases of late), and if you want to pick it up then go ahead and do so. But at least wait for a price drop.